Object markers are used to mark obstructions within or adjacent to the roadway. These obstructions could be physical objects such as guard rails, utility poles, bridge abutments, underpass piers, etc. They can also be other roadside conditions that might make it undesirable for the motorist to leave the road such as islands, narrow shoulders, drop-offs, etc. The more points of reference a driver has the more safely he or she can navigate. 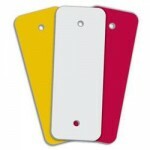 Our Object Marker signs are MUTCD / DOT compliant and made with the highest quality .080 aluminum, coated with the industries best 3M or Avery reflective sheeting and printed to last beyond the sheeting warranty. This figure illustrates 13 object and end-of-roadway markers. Three types of object markers are shown. OM1-1 is shown as a yellow diamond shape with nine yellow circles denoting yellow retroreflectors mounted symmetrically in three diagonal rows on the marker. OM1-2 is shown as a black diamond shape with nine yellow circles denoting yellow retroreflectors mounted symmetrically in three diagonal rows on the marker. OM1-3 is shown as an all-yellow diamond shape. OM2-1V is shown as a vertical white rectangle with three yellow circles denoting yellow retroreflectors in a vertical column on the marker. OM2-2V is shown as a vertical all-yellow rectangle. OM2-1H is shown as a horizontal white rectangle with three yellow circles denoting yellow retroreflectors in a horizontal row on the marker. OM2-2H is shown as a horizontal all-yellow rectangle. OM-3L is shown as a vertical rectangle with diagonal alternating black and yellow stripes. The stripes are at a 45-degree angle beginning at the upper left and slanting down to the right. OM-3C is shown as a vertical rectangle with diagonal alternating black and yellow stripes that form upward-pointing chevrons. OM-3R is shown as a vertical rectangle with diagonal alternating black and yellow stripes. The stripes are at a 45-degree angle, beginning at the upper right and slanting down to the left. OM4-1 is shown as a red diamond shape with nine red circles denoting red retroreflectors mounted symmetrically in three diagonal rows on the marker. OM4-2 is shown as a black diamond shape with nine red circles denoting red retroreflectors, mounted symmetrically in three diagonal rows on the marker. OM4-3 is shown as an all-red diamond shape. When used for marking objects in the roadway or objects that are 2.4 m (8 ft) or less from the shoulder or curb, the mounting height to the bottom of the object marker should be at least 1.2 m (4 ft) above the surface of the nearest traffic lane. When used to mark objects more than 2.4 m (8 ft) from the shoulder or curb, the mounting height to the bottom of the object marker should be at least 1.2 m (4 ft) above the ground. When object markers or markings are applied to an object that by its nature requires a lower or higher mounting, the vertical mounting height may vary according to need. Obstructions within the roadway shall be marked with a Type 1 or Type 3 object marker. In addition to markers on the face of the obstruction, warning of approach to the obstruction shall be given by appropriate pavement markings (see Section 3B.10). To provide additional emphasis, large surfaces such as bridge piers may be painted with diagonal stripes, 300 mm (12 in) or greater in width, similar in design to the Type 3 object marker. The alternating black and retroreflective yellow stripes (OM-3L, OM-3R) shall be sloped down at an angle of 45 degrees toward the side on which traffic is to pass the obstruction. If traffic can pass to either side of the obstruction, the alternating black and retroreflective yellow stripes (OM-3C) shall form chevrons that point upwards. Appropriate signs (see Sections 2B.33 and 2C.20) directing traffic to one or both sides of the obstruction may be used instead of the object marker. Objects not actually in the roadway are sometimes so close to the edge of the road that they need a marker. These include underpass piers, bridge abutments, handrails, and culvert headwalls. In other cases there might not be a physical object involved, but other roadside conditions exist, such as narrow shoulders, drop-offs, gores, small islands, and abrupt changes in the roadway alignment, that might make it undesirable for a road user to leave the roadway, and therefore would create a need for a marker. Type 2 or Type 3 object markers may be used at locations such as those described in the preceding Support paragraph. If used, the inside edge of the marker shall be in line with the inner edge of the obstruction. Standard warning signs (see Chapter 2C) should also be used where applicable. The end-of-roadway marker is used to warn and alert road users of the end of a roadway in other than construction or maintenance areas. 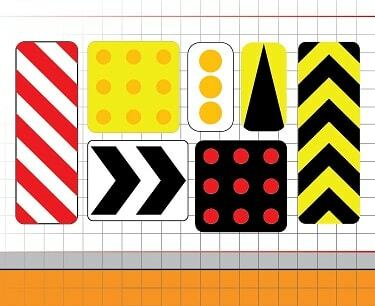 The end-of-roadway marker (see Figure 3C-1) shall be one of the following: a marker consisting of nine red retroreflectors, each with a minimum diameter of 75 mm (3 in), mounted symmetrically on a red (OM4-1) or black (OM4-2) diamond panel 450 mm (18 in) or more on a side; or a retroreflective red diamond panel (OM4-3) 450 mm (18 in) or more on a side. The end-of-roadway marker may be used in instances where there are no alternate vehicular paths. Where conditions warrant, more than one marker, or a larger marker with or without a Type III barricade (see Section 3F.01), may be used at the end of the roadway. The minimum mounting height to the bottom of an end-of-roadway marker shall be 1.2 m (4 ft) above the edge of the pavement. Appropriate advance warning signs (see Chapter 2C) should be used.